Application: Drapes well to protects surfaces, e.g. furniture, carpets, floors, from dust and dirt whilst completing decorating/renovation projects. Strong, tear resistant cotton twill fabric. Long lasting: Fully washable and reusable. Large coverage area: approx. 108 sq feet (10 sq m). Size: 12' x 9' (approx. 3.65m x 2.75m). 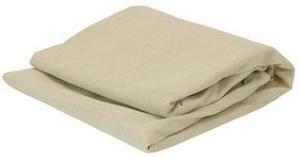 Please note: Cotton twill dust sheets are porous and do not provide complete protection from spillage.